Mount Auburn Cemetery in Cambridge, Massachusetts is the first rural cemetery in the United States. The cemetery has now been swallowed up by the city of Cambridge but it's an idyllic spot to take an afternoon walk. We took the public bus to Mount Auburn from Harvard Square. Both the MBTA 71 and 73 buses will drop you off at the cemetery gate. Guide maps are available for purchase at the visitors center near the entrance to the cemetery and are well worth the token cost (it's easy to get lost at Mount Auburn without a map). Mount Auburn also features a serene lake with gazebo on it's shore. The cemetery is a zen retreat from the hustle and bustle of Cambridge. 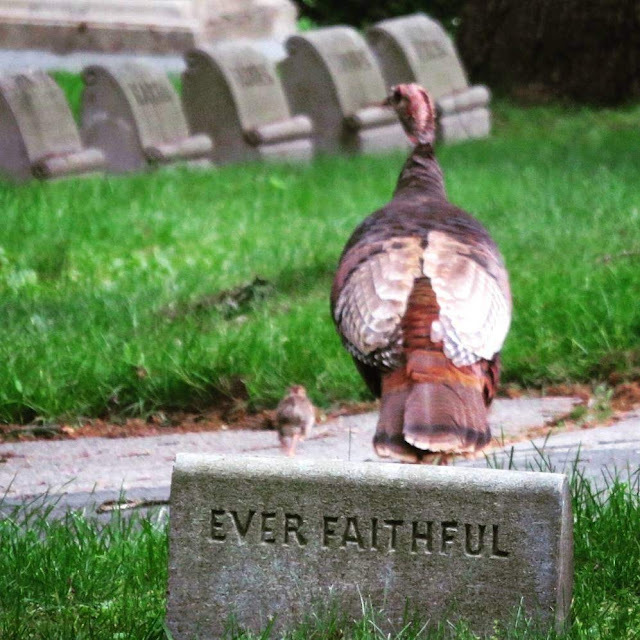 While Mount Auburn is open to the public as a park, it is first and foremost a cemetery. We took time to admire both ornate and weathered gravestones. Mount Auburn Cemetery features a stone observation tower. Climb to the top for sweeping views over the Charles River and Boston. One of my favorite aspects of Mount Auburn was the wildlife. We spotted cute chipmunks and bunny rabbits. We then saw something unexpected at Mount Auburn; a mama turkey and a brood of about 10 chicklets! We spent about 15 minutes following the mother gobbler around (from a safe distance; we didn't want to scare them) and watching the chicks run to and fro. The turkeys totally made my day! It was hard to believe that we were just a short bus ride away from Harvard Square! Mount Auburn Cemetery is heavily forested in parts which means there were lots of birds about with their song adding additional atmosphere to this peaceful park on the outskirts of Cambridge. We visited Mount Auburn Cemetery in early June. I was in awe of the amazing flowers blooming all over the place. 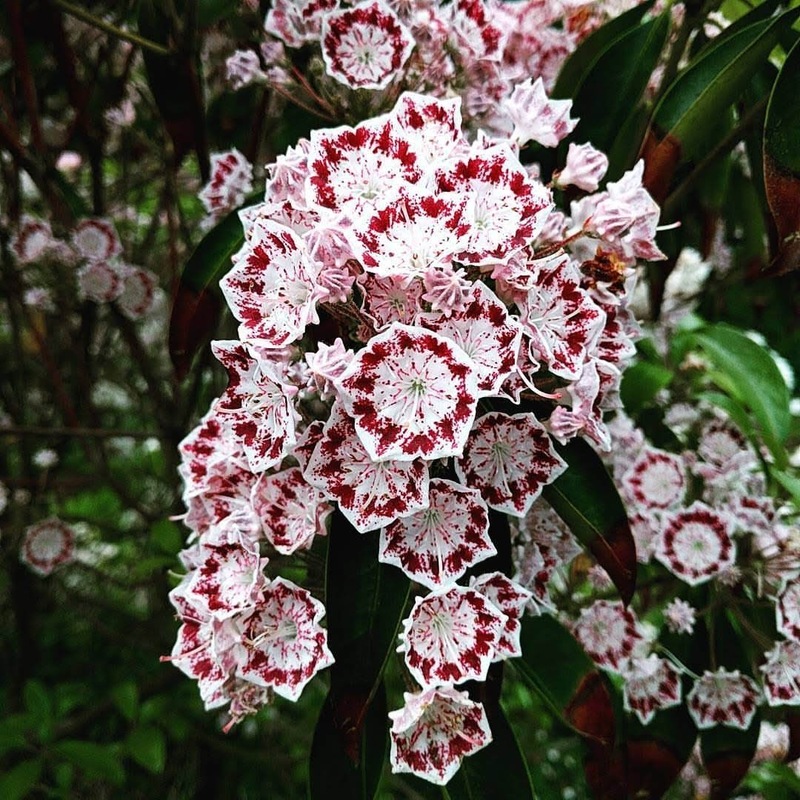 The color patterns of the flowers were so intricate. In the center of Mount Auburn, there is a proper bog. We forgot for a while that we were sitting in a graveyard rather than out on a country hike. The atmosphere at the bog is so peaceful, you'd never guess Boston is right outside these gates. The chapel at Mount Auburn Cemetery is worth a look. The architecture makes it look like a mini-cathedral. Very grand in style. The final stop on our walk through Mount Auburn Cemetery was The Sphinx. The Sphinx is a memorial to those that died during the American Civil War. This was a solemn reminder that Mount Auburn dates back to the early 1800s and thus was a witness to many inspiring (and brutal) events in American history. Is Mount Auburn Cemetery worth visiting? As you can see from our experiences, it is an idyllic place to spend a zen afternoon in Cambridge. Definitely check it out! 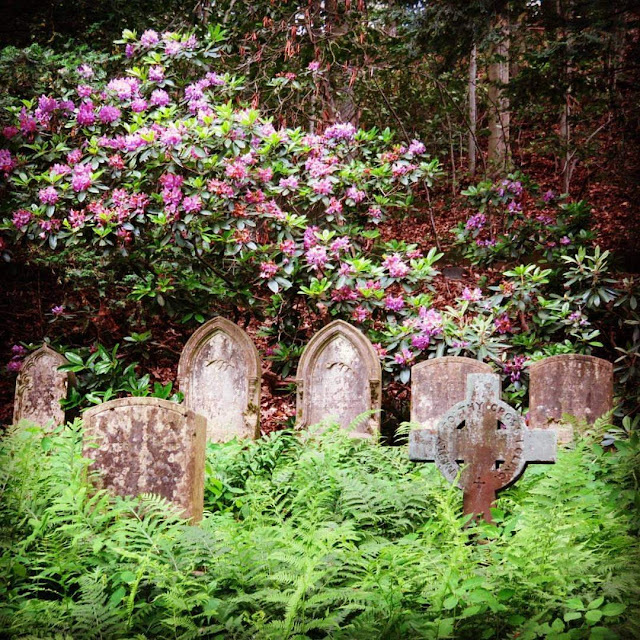 Explore scenic Mount Auburn Cemetery in Cambridge, Massachusetts. A photo-rich post written by travel blogger, Jennifer (aka Dr. J) from Sidewalk Safari.